There is little doubt that the family name of SELWOOD was taken from the primeval Forest of Selwood which once clothed the countryside over an area from Bath southward to Sherborne, Dorset and Malmesbury, Wiltshire, Wiltshire to Queen Camel and South Somerset, taking in Glastonbury in a line with the River Parrett. SELWOOD is mentioned as early as 658 A.D. in Anglo-Saxon records when Cenwalk fought against the Welsh at Penselwood. Over the passage of history, there have been many variant spellings of the name. Other spellings of the name are Selewoda, Celewood, Selwode, Sellwood, Selward, Silwood, Zealwood, Zelwood and Zillwood. St. Aldhelm (born 639 A.D. in Wessex) was at one time the Bishop to West Selwood in 703 A.D> He was counsellor to King Ine and the first English scholar of distinction. He died in 709 A.D. at Doulting. In the 15th-18th century, SELWOOD families also lived at Worle and Knewstoke areas near Weston-super-Mare and once owned a manor house known as "THE NEWTONS". SELWOOD FOREST is no longer the size it once commanded, and what remains is situated in the area of Longleat Park. The above information was sent by Brian Passmore of Taunton, Somerset, whose wife is Rita Selwood. She is descended from our Great-grandfather's brother James Selwood. As early as 1370 during the reign of King Edward III there was a John Selwood residing in Bristol, England. He is mentioned in the book "Ordinances for the Drapers". In "Chronicles of Bristol" a John Selwood is listed under Sheriffs and Bailiffs for 1390. There is no indication at this time that he was an ancestor of ours. Our Selwood ancestors have been traced back to a John Selwood, a tanner, who was born in 1799. A genealogist whom I hired to search this line tells me that the earlier ancestors came from a place called West Buckland, Somerset, not far from Bristol. Our later ancestors, Grandma Emma Selwood Yeo's parents and her siblings were born in Bristol. John Selwood's son John who was the father of the above Grandma Yeo was born in 1824 in Bristol and married Mary Hitchcock, daughter of John Hitchcock at the church of St. Peter's Parish, Bristol, on May 11, 1843. The rector, H.C. Brice officiated. 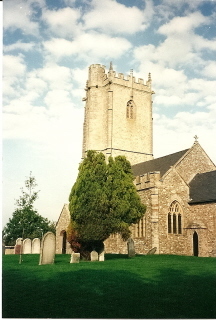 West Buckland Church, Somerset where John & Grace were married and their children were baptised. St Peter's Church, Bristol where John married Mary Hitchcock. Mary, Jane, Edwin, Sarah, Maria & Emma. Edwin, the only male child of the family drowned in the English Channel when a young lad. Our Grandmother, Emma Selwood Yeo, wife of John Yeo was born 29th February 1856 at Glasshouse Court, St Mary Redcliffe Parish, Bristol, Somersetshire, England. She attended the Blue Maids' School (later Red Maids' School) supervised by St. Mary Redcliffe Parish Church. This church, which at one time was the largest in England was built in 1293. Queen Elizabeth I pronounced it "the goodliest, fairest and most famous parish church in England." This school was affiliated with a similar school for boys; children of working parents. The curriculum for the girls consisted of practical skills: cooking, dressmaking, millinery and housekeeping. I have a sampler which Emma Selwood made at age 9, showing her proficiency in mastering a variety of stitches. The boys learned trades which would help them earn a living. Emma later completed a study of all types of sewing and became adept at dressmaking and millinery; designing as well as making hats. The Redclife Blue Maids' School was later combined with the St. Mary Redcliffe Voluntary School in 1869, the purpose of this school, and a similarly endowed boys' school was to give the students the same privileges as those of the parochial schools. John born October 11, 1877 and Emma, born July 2, 1879. The family subsequently emigrated to the United States. Following Charlotte's death, John emigrated to the United States in 1894 and made his home with Emma and John Yeo on the family farm near Minneota. He died March 15, 1904 and is buried in the Burton Township Cemetery, as is his daughter, Emma Selwood Yeo and her husband John Yeo, Sr. Also buried there are one son and daughter-in-law, Bert Yeo and Ona Struthers Yeo. The above information was sent me by Rita Selwood Passmore of Taunton, Somerset. There is some doubt in my mind as to the dates of James' parents marriage and death, hence I am not going to include the chart information here. Suffice it to say, our ancestor, John Selwood was born in West Buckland Parish, Somerset in 1798. In 1861 John and Mary were living at 8 Great Avon Street, in St Mary Redcliffe and John was an oil distiller. 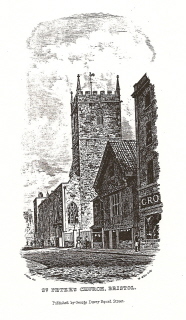 By 1871 they had moved to 70, Oxford Street in Bedminster, nr. Bristol. John was then a bricklayer, daughter Mary was a tailoress and Emma was working in the tobacco factory. Emma Selwood was born in Bristol. She was the last of six children born to Mary Hitchcock Selwood and John Selwood. At the time of her birth the family lived at Glasshouse Court, St. Mary Redcliffe Parish, Bristol. During the Second World War much of this area was damaged and has since been rebuilt. The area now is the site of many large skyscrapers. 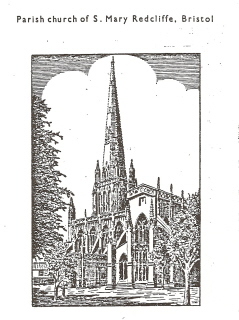 Emma attended the Blue Maids' School supervised by St Mary Redcliffe Church. This church, which at one time was the largest in England was built in 1293. Queen Elizabeth the First pronounced it lithe good/iest, fairest and most famous church in England ". This school was affiliated with a similar school for boys; children of working parents. The curriculum for the girls consisted of practical skills; cooking, dressmaking, millinery and housekeeping. I have a sampler which Emma made at age 9, showing her proficiency in needlework.The boys learned trades which would help them earn a living. Emma later completed a study of all typed of sewing and became adept at dressmaking and millinery: designing as well as making hats. On January 1, 1877 Emma Selwood married John Yeo in Glamorganshire Parish, Cardiff, Wales. 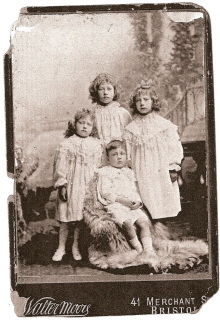 Their two older children were born in Cardiff: John born October 11, 1877 and Emma, born July 2, 1879. Mary Hitchcock Selwood died in 1872 when the family was living in Bedminster, near Bristol. John Selwood subsequently married a lady named Charlotte and in 1891 they were living in Roath, Wales and John was a mason .Nothing more is known of her. After her demise, John emigrated to the United States in 1894 and made his home with Emma and her husband John on their farm in Minnesota. He died March 15, 1904 and is buried in the Burton Township Cemetery, as is his daughter Emma Selwood Yeo and her husband, John Yeo, Sr. Also buried there are one son and daughter-in-law Bert Yeo and Ona Struthers Yeo. Believe this to be John Selwood's second wife with one of his daughters by Mary. After emigration to the United States in 1881, John Yeo and his wife and two children went to Northern Michigan where John worked in the mines. John bought some land in Southern Minnesota from the Winona and S1. Peter Railroad and began farming in Lyon County. Emma and John had thirteen living children. She was a good wife and mother and, as her obituary relates, was well thought of not only in the farming community but also in their home in town. Emma died before I was born and! have regretted not knowing this wonderful person. Not a great deal is known of Emma's siblings. I know that an aunt did correspond with Jane's children: I believe this family eventually moved to Canada. They did keep up with Aunt Myra and visited her in California at times. A genealogist, Elaine Zair of Bristol was unable to find any information on Mary Hitchcock, nor was she able to find a record of the oldest child, Mary's birth. It is possible she was the child of a previous marriaige or was born out of wedlock. The only son, as I mentioned, Edwin John died at age 10. 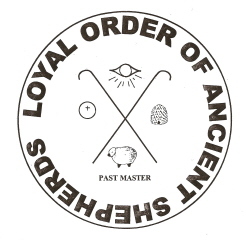 The Loyal Order of Ancient Shepherds was a friendly society set up by working class people. Members paid a regular subscription and if one of theOrder became ill or became unemployed, he would receive money from the Society's funds. Some associations paid for their member's burial expenses. The Loyal Order of Shepherds was founded on December 25, 1826 at the Friendship Inn on Old Street in Ashton-under-Lyme, Lancashire. Legen d has it that the Society was called Ancient Shepherds because it was founded on Christmas Day. The word Loyal was added in order to remove any unfounded suspicions surrounding the Society's objectives. At that time trades unions and many working class political associations were banned while the conduct of benefit and burial societies were strictly regulated. In 1829 a number of subsidiary branches were formed in the Lancashire district at Ashton, Oldham, Rochdale and Ossettand and the Society gradually gained support in other areas of the country. Friendly Societies generally met in pubs. The Order is still in existence and can be contacted at SHEPHERDS HOUSE, Stockport Road, Cheadle, SK8 2AA. The Order produces a booklet detailing the Society's history plus a list of the prominent members. The Order's branch records are held locally, in regional and county record offices, and some are kpt by university libraries.